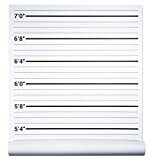 This cool new Mugshot Backdrop Height Chart from Papery Pop is just like the backdrops used by real jails for mugshots and criminal lineups, except this one is for collecting photographic evidence in a photo album / case file of your kids slowly growing up, year after year. Just hang this clever backdrop on a wall, ensuring that the measurements are at the correct height and then on each birthday, have your kid pose for their mugshot and maybe hold up a suspect-style sign showing how old they are. Don't forget to get both front and side view shots. The backdrop shows measurements from 3' 3" to 7' 1", is printed on high quality thick poster material and laminated using a matte finish, and has bold, easy to see measurement lines. Perfect for kid's birthdays, wedding reception photo booths, and more.